The unstoppable Patriots met their match tonight. Wow what a game. Eli made some crazy plays tonight and the D was too tough for Brady. 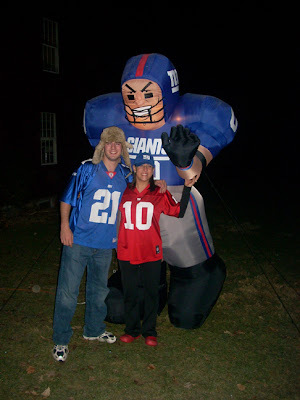 Here's a shot of Deana and her brother Chris in front of the inflatable Giants man. SUPERBOWL CHAMPS!!!!! !